When you visit the AnyConnect VPN Client site, the automatic installation does not work. Follow the link on the page to download the installer: vpnsetup.sh . Change the directory to where you save the script. It’s usually ~/Downloads . Type the command in the Terminal window. The permission for the vpnsetup.sh is wrong; fix it by typing the following command. Run the script. You will need to supply your password for this command. The client should be installed now. 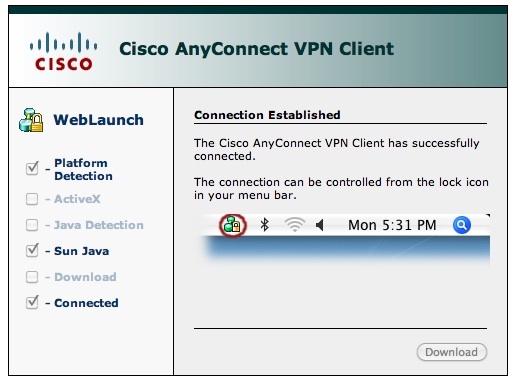 Point your browser back to your company’s Cisco AnyConnect VPN web site again and it should connect.